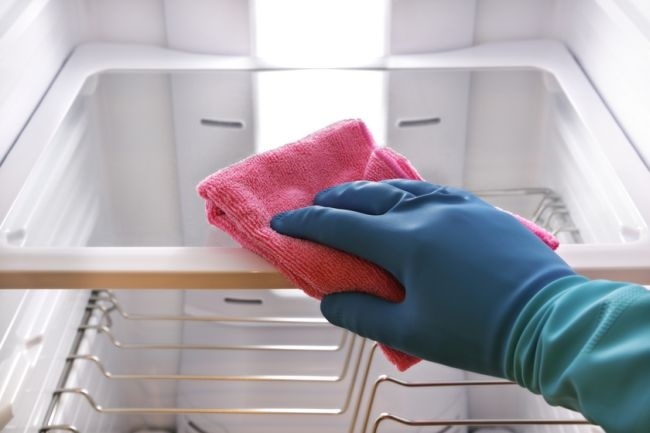 While it’s true that a lot of cleaning products, detergents and other household supplies do more harm than good, it’s almost impossible to completely withdraw from using household chemicals, but you can try to reduce your use of them. 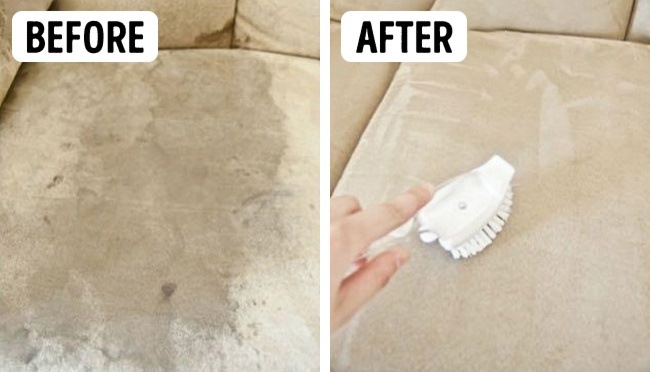 The team has selected some awesome tips that will help you clean your house using products easily found in any kitchen. To clean superficial dirt, put the liquid on a sponge and give the tiles a wipe. Then wash the surface with water. 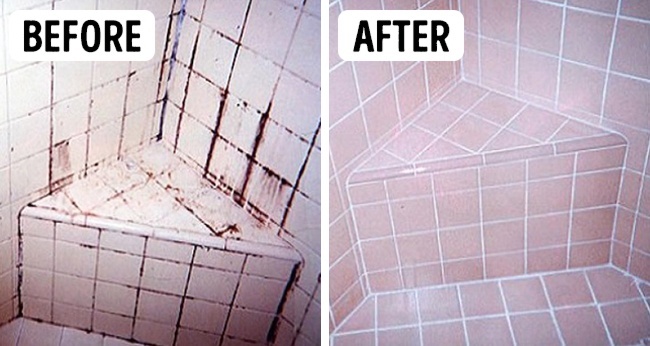 If the tiles are really filthy, put some liquid on them and on grout as well. Leave it for 10 minutes. During this time, dirt will dissolve and it would be easier to clean it off. Repeat the process one more time and wash the surface with water. If you want your bathroom to stay clean for a long time, use the following technique: mix water and vinegar in the ration of 1 to 1 and spray tiles and grout with this liquid twice a week. Dip a Q-tip into ammonia-anisic drops and rub greasy spots. To clean ingrained grease, use a tooth brush and a regular sponge. Always put on gloves to protect your hands and skin. Boil water in a big pot. Slowly pour out soda into water using a teaspoon. Put filters into boiling water. Grease and dirt will immediately start dissolving. Remove the pot from fire in a couple of minutes. 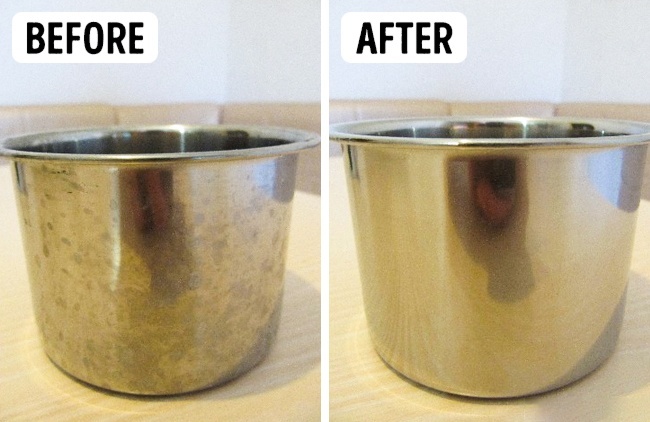 If filters are extremely dirty, repeat the process with a fresh supply of water. If grease didn’t clean off completely, put the filters in hot water with ammonia (1/2 glass of ammonia for 118 fl oz (3.5 l) of water). It’s necessary to open windows and put on a filter mask to protect yourself from the strong smell of ammonia. 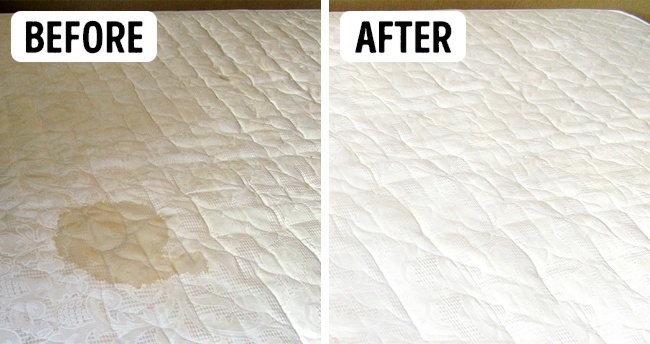 Make the mixture right before you are going to clean a mattress as it’s more effective this way. Mix baking soda and peroxide in a spray bottle. When baking soda dissolves, drip liquid soap in there. Shake the bottle and spray а dirty spot. Leave it for 5-10 minutes. If you want it to dry faster, turn on a fan and point it to the spot. 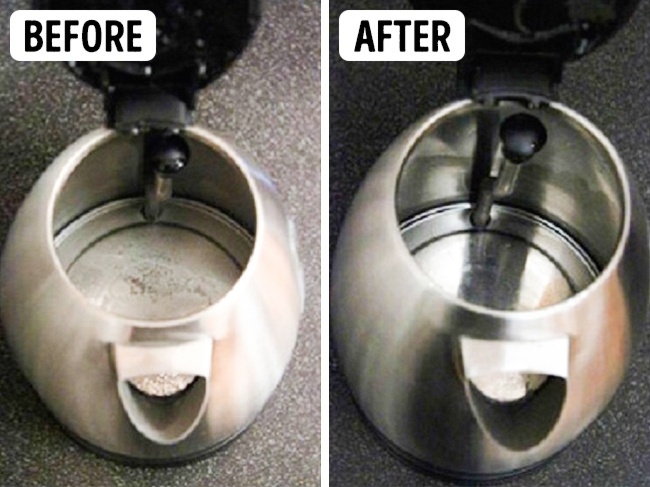 Clean off the remnants of baking soda with a vacuum cleaner. Put some ammonia into a small bowl and leave it in a turned off oven for a night. 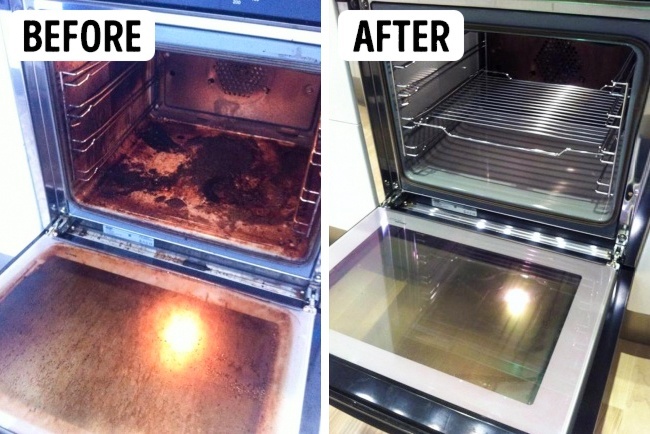 Give your kitchen a good airing in the morning and wash the oven; grease will peel off easily. There should be no odor left. The only downside to this method is the smell, so please don’t forget to work with gloves and with the windows open. To get rid of kettle furring, fill the kettle up to half or three quarters level with equal parts of water and vinegar. Cork the kettle nose (for example, you can make a «cork» out of paper) and boil water for as long as you need for furring to come off. Then wash the kettle well. The best possible safe dish-washing mixture is baking soda and dry mustard in the ration of 1 to 3. Mix both powders and put them into a bottle with holes in the lid. It’s easy to use. To clean your toilet use pure vinegar. It’s also a great disinfectant! funky odor, put some baking soda on as well. 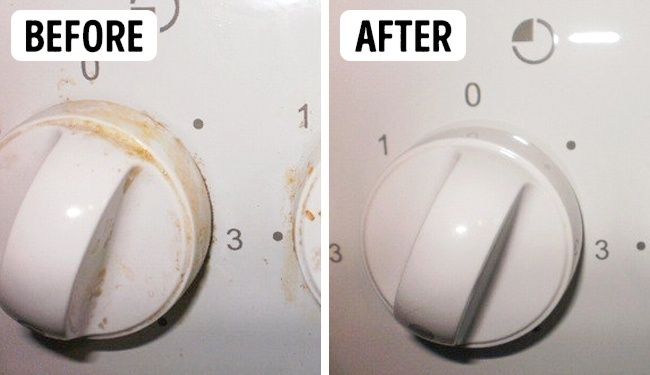 Dissolve 2 tablespoons of baking soda in 34 fl oz (1 l) of water and scrub the inside of the refrigerator with it. Then wipe it with a soft cloth.